April is when sports, music, and culture collide on Twitter. People will come to Twitter to track the #NFLDraft, check out the musical acts of #Coachella, and see how their favorite #MLB teams are playing. 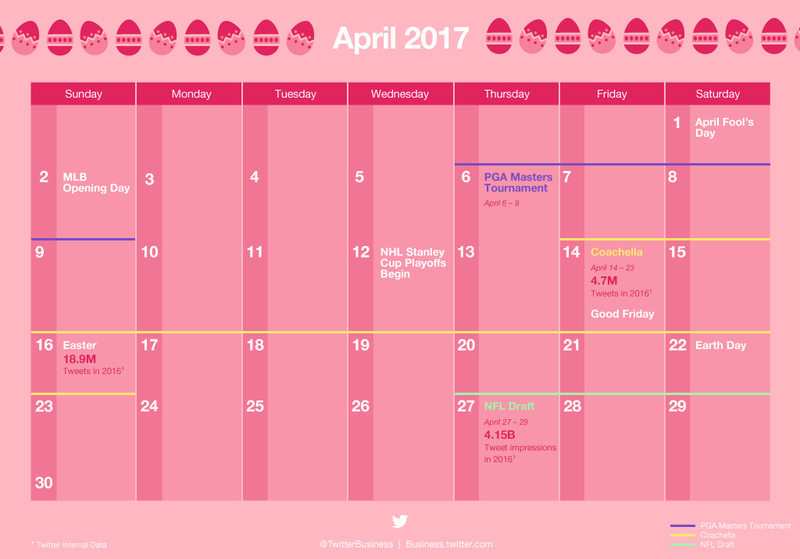 And with celebrations for Easter and Earth Day, there are plenty of opportunities for your brand to show your personality on Twitter with relevant content. Download our April 2017 marketing calendar to help plan your campaigns around these key dates, and read on for tips on how to thoughtfully frame your content and creative throughout the month. People on Twitter like seeing brands join the conversation with relevant content or deals, and the same can be said about ads — 42% more time is spent looking at Twitter Ads relevant to surrounding content. * Align ad creative with suitable topics to reach baseball fans (from local teams to #OpeningDay), or people getting ready for Easter (from Easter egg hunts to the #EasterBunny). 74% of people on Twitter will attend a music festival in the next 12 months. Not only are Twitter's music fans more likely to attend these events, they're interacting with music festivals even when they’re not there — 42% have watched a live stream of a music festival and used Twitter to follow music festivals. ** Use event and keyword targeting to reach this relevant audience. Holiday and event hashtags are a simple way to tap into relevant conversations and reach a wider audience. In 2016 there were over 10.3 million Tweets with hashtags related to Easter. *** While hashtags like #Easter will be predictable, others may start trending in the moment. Keep an eye on the trends section of Twitter to identify new topics that are being talked about.